Hello, I’m Voodoo Lopez, spanish DJ based in Costa del Sol, I’d started my musical career as local dj radio during the 80’s at the same time playing pop rock in a local band, as rhythm guitar, singer and composer.Â Â I love music. My father is a great classic music lover, so I’d involved in any kind of music since I was a child. I’d enjoyed the disco music during the 70’s, the classic rock bands, so for me the best thing in life was to be a musician. I specially adore Bossa Nova, Nu jazz, Lounge classics from Johnn Barry, music for movies, and of course, SOUL and there was a time in the early 90’s that I’d discovered that there was more evolution into the electronic side than the normal rock bands, repeating the same schemes during ages. During those days I’d listening a lot from chill and ambient, and Acid Jazz. 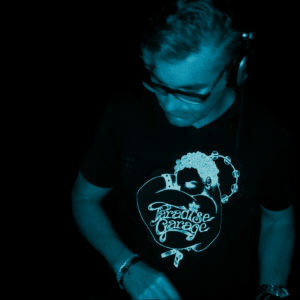 I was a dj in a disco bar in my town, so House music start to surrounding me, early classics and commercials from those days, till later, I was shocked to see that one of my favorite bands moved into electronica, with Massive Attack works with Everything but The Girl, and specially the “Protection” work with Tracey Horn. This song change me a lot. This was the point. So I swing into the House classics, discover the continuity of the classic disco on followers of the Paradise Garage, full of the Soul Music I ever adored. Yes, man, Marvin Gaye is God. One of my learning on House music comes from my friend Mario Atienza, talented figure and friend, Detroit sound follower, House Head and music critical in Seville, who show me the darkest side of music, and also the strong spirit in early house productions. And then, Portugal. I love this country because the local music culture is bigger than in Spain and people listen with respect. Like if Ibiza were a whole country without hooligans. Incredible beaches, Incredible Clubs, Incredible people. And close to 2000, my wife and I travelled to discovers that they are the perfect reflection of San Francisco sound in Europe, but with absolutely elegance and inspiration. And of course, with a big house music lovers scene. There was DEEP. There I meet friends, local and foreign dj’s only interested to preserve this spirit, so with DJ Grooveman (Hernani Sousa, owner of a portuguese club) and with Stephane Manzone, french dj from Marseille, we created GPS FOUNDATION just to continue promoting parties in deep and soulful spirit, during the last 6 years. In 2000 I’d started to play in local clubs in Seville, mixing all the things that I’d like. But never found the same vibe as in Portugal or Ibiza. CafÃ© del Mar, Lisboa Club, Arena, no so much, but just for enjoy and play the music I love. What is Deep? some kind of music that touch your soul. There would be loops, atmosphere, voices, visual passages in your mind, there must be light and darkness, and something inside that brings you intensive feelings. This is an estate of mind and soul. And you know that people who likes deep is absolutely different for others. Because we are members of a kind of club that share the music in their souls. We are true believers! And I hope that you enjoy my mixes here in Dogglounge Deep family.